House Minority Leader Nancy Pelosi (D-CA) has been hitting the campaign trail, trying to clinch more Democrat seats in the House that would see her return to being House Speaker and a raft of Democratic-launched investigations into the Trump administration. “This is a close election. Twenty-five thousand votes could determine all of that, that we want to protect and respect and aspire to. 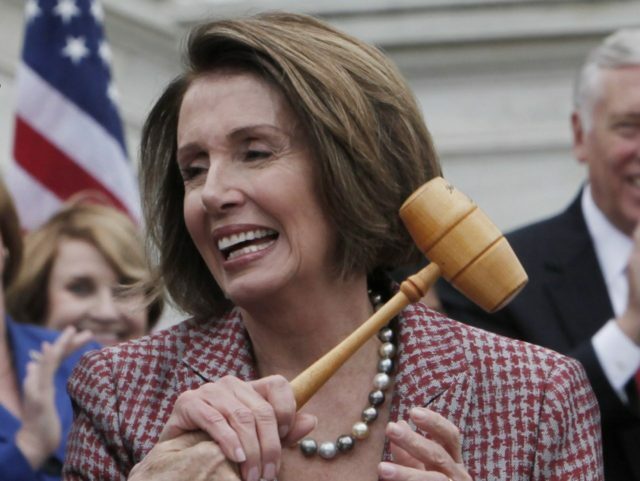 Twenty-five thousand votes in the whole country could determine the gavel,” she said. If Democrats take back the House, Pelosi is expected to retake the gavel despite earlier challenges, and fierce anti-Trump haters would gain the chairmanships over key Congressional committees. Rep. Maxine Waters (D-CA), who has led the party’s call for impeaching Trump, would become chairwoman of the House Committee on Financial Services. Rep. Adam Schiff (D-CA), who has pushed the theory that the Trump campaign colluded with Russia, would become House Intelligence Committee chairman. Rep. Elijah Cummings (D-MD) would become chairman of the Committee on Oversight and Government Reform. With chairmanships, Democrats would have the power to schedule hearings and issue subpoenas. Schiff has said he would reopen the House Intelligence Committee’s investigation on whether the Trump campaign colluded with Russia and launch others. Axios reported earlier this year that there was a spreadsheet being circulated among Republican circles on Capitol Hill of the dozens of investigations Democrats plan to launch if they retake the House. Democrats would likely try to bog down the administration with investigations in the leadup to the 2020 presidential election. Julie Pace, bureau chief of the Associated Press, previewed on Sunday what to expect if Democrats take the House. “This question about what happens if Democrats take the house is a big cloud over this White House. Democrats will have subpoena power. They will be launching, as they already said, a whole raft of investigations,” she said on Fox News Sunday. “Trump’s taxes. Financial dealings of other people in the administration in the cabinet. This is something that would dominate 2019 for the president,” she said. “The White House, because they are understaffed, they don’t have the infrastructure in place to deal with a lot of Democratic investigations,” she said.